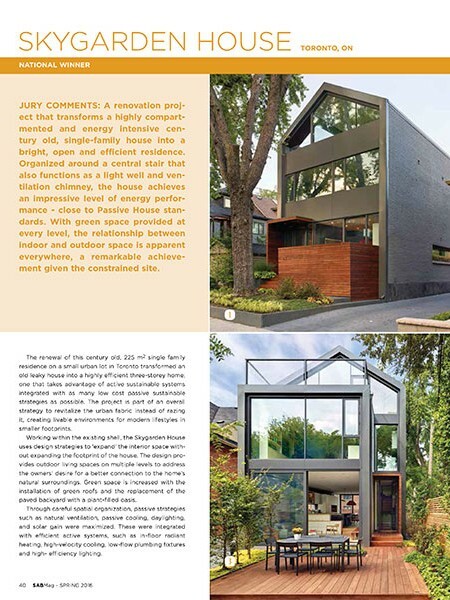 SABMag's dedicates their Special Issue to the 2016 Canadian Green Building Awards, and Skygarden House is included as one of nine winners. The article describes transforming the existing shell of an old house into a highly efficient three-story home, to take advantage of active sustainable systems integrated with as many low cost passive sustainable strategies as possible. The design provides outdoor living spaces on multiple levels, along with green roofs and the replacement of the paved backyard with a plant-filled oasis.